I just bought an Organic Engines Troika. It was local(!) and price looked (too) good. It is in excellent condition, was stored indoors, suspended, for several years. Chains and moving parts are stiff from hardened lube, but appear to be in excellent condition. I can find virtually no info on this trike - what do I have? As you may have guessed, Organic Engines is out of business. 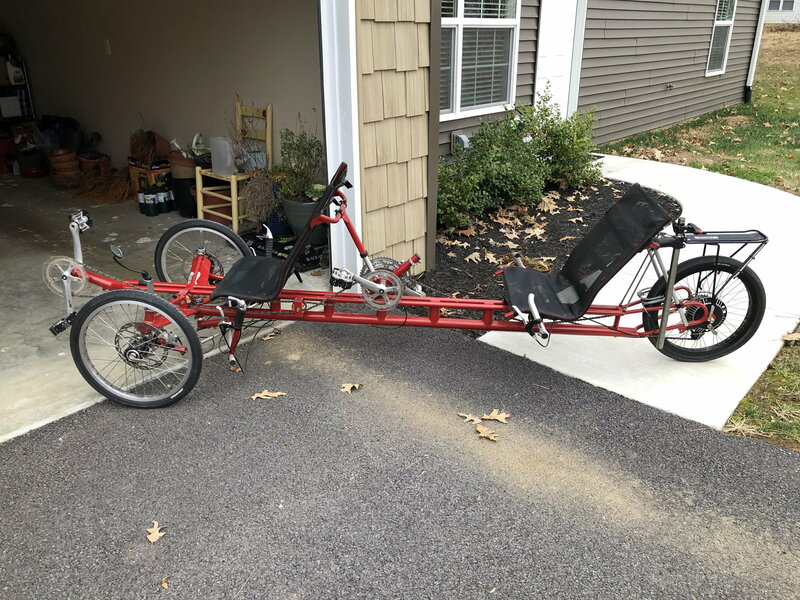 Take a trip over to Bentrider www.bentrideronline.com where you will come across a few others who own this nearly 10 foot long tandem trike. You will have to join to use the search function since you need to be logged in to use it (it's free). Here's one that comes up https://www.bentrideronline.com/mess...Engines+Troika. I also found a Troika a few years ago for a ridiculously low price. We have put around 6500 miles on it and I have done tons of modifications. The first thing I did was to add a pad to the seats. You end up sitting down on the frame otherwise. We used something like this: https://www.amazon.com/Computer-Prov...%2C166&sr=8-15 and I cut the bottom part of the foam so it would sit between the frame rails of the seat. It makes it wonderfully comfortable for all day rides. The next mod I did was to change the steering to direct as opposed to indirect which helped improve the turning radius. After a knee injury, I installed electric assist and independent pedaling as well. The only thing I don't like about ours is that it has drum brakes as opposed to the discs that are on yours. There is no tandem trike I would take over the Troika, including the high end Greenspeed.